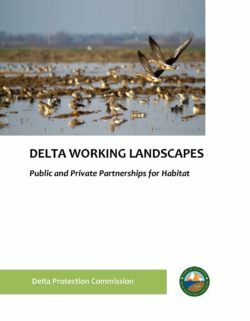 This final report of the Delta Landscapes Project, A Delta Renewed, offers guidance for creating and maintaining landscapes that can provide desired ecological functions for decades to come. 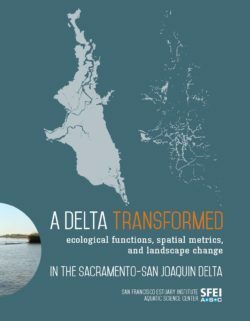 Based on extensive research into how the Sacramento-San Joaquin Delta used to function, how it has changed, and how it is likely to evolve, we make recommendations for how to re-establish the dynamic natural processes that can sustain native Delta wildlife as healthy populations into the future. The approach, building on work others have piloted and championed, is to restore or emulate natural processes where possible, establish an appropriate configuration of habitat types at the landscape scale, and use multi-benefit management strategies to create a more viable Delta ecosystem that can adapt and continue to provide valued functions as the climate changes. This approach is designed to integrate with the human landscape: ecosystem improvements as a part of a robust agricultural economy, water infrastructure and diversions, and urbanized areas. Strategic restoration which builds on the history and ecology of the region can contribute to the strong sense of place and recreational value of the Delta in the future. 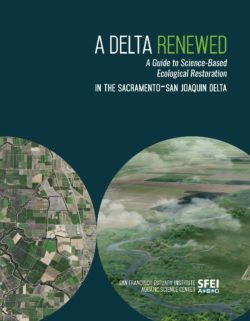 In A Delta Transformed, completed in 2014, SFEI researchers used the spatial data generated in the Delta Historical Ecology Investigation, as well as updated modern vegetation and land cover datasets, to carry out detailed analyses of how the Delta landscape has been altered since the early-1800s. By quantifying changes in metrics relevant to native wildlife (such as the extent and timing of inundation, habitat patch sizes, length of channel networks), the report provides a foundation for defining, designing, and evaluating landscapes that support desirable ecological functions in the future. 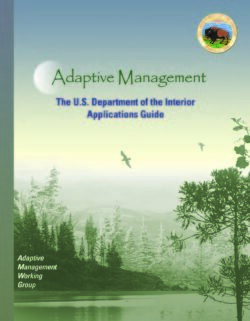 The Department of the Interior (DOI) Adaptive Management Working Group sponsored the development of this applications guide to provide thorough examples for a better understanding of how adaptive management can be implemented in the field. The Adaptive Management Working Group includes representatives from most DOI bureaus and offices. Writing teams of resource managers, technical experts, and other specialists worked with the group to identify and describe applications of adaptive management in four thematic areas: climate change, water resources, energy resources, and the interface of human and natural systems. These themes were chosen to illustrate the elements and processes of adaptive management because of their importance to DOI management responsibilities, the current interest in the thematic areas in using adaptive management, and the broad potential in each thematic area for learning-based management. In writing this guide, we attempted to provide enough background about the elements of adaptive management implementation, and the challenges in implementing it, to give the reader a context for the resource examples. We also sought to provide enough detail in the examples to illustrate clearly the elements of adaptive management. Thus, the guide includes summaries of the principles and issues relevant to adaptive management, followed by descriptions of potential and actual applications in each of the four thematic areas. The intention was to provide enough detail about the actual process of adaptive management to be informative, while limiting the scope, complexity, and size of the document. 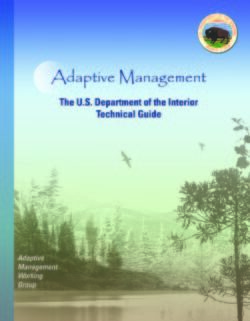 The Department of the Interior (DOI) Adaptive Management Working Group (AMWG) sponsored the development of this technical guide to clearly and consistently define adaptive management and describe conditions for its implementation. AMWG membership includes representatives from across DOI’s bureaus and offices. A writing team of resource managers, technical experts, and other specialists worked with AMWG to address four basic questions concerning adaptive management: (1) What is adaptive management? (2) When should it be used? (3) How should it be implemented? (4) How can its success be recognized and measured? These questions were used to organize both the writing effort and the structure of the guide itself, with individual chapters addressing each of the questions. The authors sought to describe adaptive management at an appropriate level of technical detail, while remaining focused on its definition, operational components, and conditions in which it applies. A key challenge was to provide sufficient detail for clarification, while limiting the length and complexity of the document. 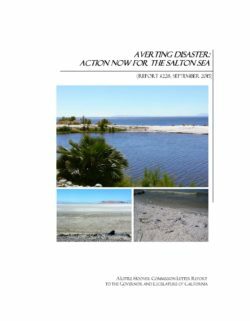 The Salton Sea is shrinking. Currently the state’s largest inland body of water, as it dries up, the Sea poses a substantial threat to public health and the environment. Left unaddressed, desert winds will lift dust from thousands of acres of newly-revealed lakebed and blow it into population centers, agricultural areas and world-class resort economies. 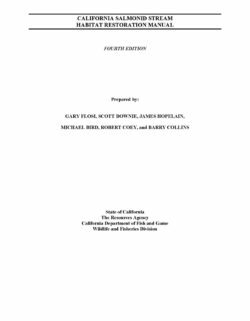 The first edition of this manual, written by Gary Flosi and Forrest Reynolds, and published in 1991, formally synthesized and described the Department of Fish and Game's approach and technical methods for anadromous salmonid habitat restoration. From 1991 through 1994 the first edition was broadly distributed and used as a "standard methods" text by many habitat restoration and resource inventory workers. As a result, many suggestions for improvement of the manual were received by the authors. The second edition, by Flosi and Reynolds was supported by a team that included the authors of this third edition, and was published in October of 1994. The second edition included a number of revisions: 1) a reorganization of sections for project planning and project implementation; 2) the just then recently revised stream channel classification system developed by David Rosgen; 3) a new monitoring and evaluation section; 4) a listing of all databases used for resource inventory and analysis as presented in the manual; 5) a protocol for a large woody debris inventory; 6) a description of required environmental review processes and permits; 7) an expanded and updated listing of sensitive species; and 8) numerous editorial changes to text and data forms. The third edition, like the second, incorporates changes recently developed in the practice of stream habitat inventory and restoration. The authorship list has changed with this edition to more accurately reflect the contributions of the writing team members. The manual is presented in binder form in this edition to more easily and economically incorporate future additions and developments as they evolve. This fourth edition incorporates all changes, corrections, and revisions of this manual up to July 2010. The manual continues in binder form in this edition to easily and economically incorporate future additions and developments as they evolve. The authors anticipate the continued widespread distribution and use of this manual will promote the implementation of the restoration techniques. Readers should also be aware that computer data entry and data summary programs are available upon request for all data collection protocols presented in this manual. Updates to this manual are available on line at http://www.dfg.ca.gov/fish/Resources/HabitatManual.asp. California is at a critical juncture on policy for the Sacramento–San Joaquin Delta. 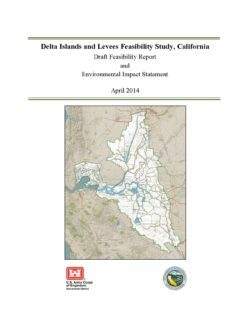 This report summarizes the results of a wide-ranging study of cost-effective ways to improve the health of the Delta ecosystem. It highlights the need for science-based, integrated management of the many sources of ecosystem stress. The report also recommends improvements to the highly fragmented system of oversight that now involves dozens of federal, state, and local agencies. 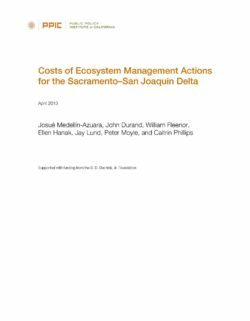 Aquatic Ecosystem Stressors in the Sacramento–San Joaquin Delta (Mount et al. 2012) summarizes the science of Delta ecosystem stressors for a policymaking audience. Integrated Management of Delta Stressors: Institutional and Legal Options (Gray et al. 2013) lays out proposals for institutional reform of science, management, and regulation. Scientist and Stakeholder Views on the Delta Ecosystem (Hanak et al. 2013) presents detailed results of the two surveys conducted by the report’s authors. Stress Relief: Prescriptions for a Healthier Delta Ecosystem (Hanak et al. 2013) summarizes the overall research project and the recommendations it generated. Where the Wild Things Aren’t: Making the Delta a Better Place for Native Species (Moyle et al. 2012) outlines a realistic long-term vision for achieving a healthier ecosystem. The U.S. Army Corps of Engineers and the California Department of Water Resources propose to restore approximately 89.5 acres of lost or degraded tidal marsh habitat in the west central portion of the Sacramento-San Joaquin Delta. The restoration work would involve transporting and placing dredged material into open water habitat to restore 80.3 acres and 9.2 acres of tidal marsh at Big Break and Little Franks Tract, respectively, in the Delta. The work would be conducted over 5 years as part of the annual operation and maintenance (O&M) dredging of the Stockton Deep Water Ship Channel. Previously stockpiled dredged material from existing dredged material storage sites would also be placed in conjunction with O&M. The draft report describes the affected environment in the Big Break and Little Franks Tract area; evaluates the direct, indirect, and cumulative environmental effects and the benefits of the tentatively selected plan and two alternative plans; and recommends avoidance, minimization, and mitigation measures. Most potential adverse effects would either be short term and insignificant, or would be avoided or reduced to less than significance using best management practices. Beneficial effects on vegetation and wildlife, special status species, other resources, and the historic floodplain from the alternative plans are also discussed. The Delta Working Landscapes Program (Program) is a group of projects which demonstrate how farmers can integrate habitat restoration into farming practices. The objectives of the Program are to improve the environmental quality of existing landscapes in the Delta; coordinate programs with local farmers; understand the social, economic, environmental and governmental policy hurdles and/or incentives to perform conservation practices; and communicate to farmers the advantages of implementing wildlife friendly agricultural practices. The Delta Protection Commission was awarded a three year grant to construct the program through the California Bay-Delta Program in 2005. 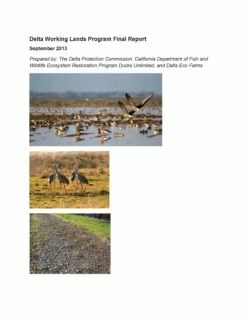 Program partners included California Department of Fish and Wildlife Ecosystem Restoration Program, Hart Restoration (Hart) and Ducks Unlimited (DU). Hart established vegetative buffers along irrigation ditch banks and hedgerow grass plantings. These plantings were designed to provide habitat for wildlife, improve water quality by reducing runoff of pesticides and sediment, enhance levee stability, and retard levee erosion. DU coordinated restoration enhancement projects which included creating seasonal and permanent wetlands on marginal farmlands. These projects provide waterfowl brooding habitat, a food source, and additional habitat sites which promote healthier waterfowl flocks. These projects total 312 acres of seasonal and permanent wetlands and 6.5 miles enhanced levees and waterways. Project areas established native plant life, have been repopulated by wildlife, and filter agricultural drainage which improves water quality and enhances levee stability. Multiple species of waterfowl are using the restoration habitat for brooding and feeding as well as staying later into the season. No easements, MOUs, fee purchases, or eminent domain were used. Challenges to Working Landscapes projects include prior long term use of pesticides and herbicides which have created a hostile environment for native plants and wildlife. Additionally, some cultural practices are not conducive to habitat creation such as practices which rely on herbicides instead of tillage. Furthermore, economic costs are affiliated with physical land alterations, and in some cases permit requirements are cumbersome. Despite these challenges, successful public/private partnerships are possible. Working Landscapes projects can be expanded through better communication between policy and regulatory agencies and publicizing successful projects. The Delta Working Landscapes Program (Program) is a group of projects which demonstrate how farmers can integrate habitat restoration into farming practices. The objectives of the Program are to improve the environmental quality of existing landscapes in the Delta; coordinate programs with local farmers; understand the social, economic, environmental and governmental policy hurdles and/or incentives to perform conservation practices; and communicate to farmers the advantages of implementing wildlife friendly agricultural practices. The Delta Protection Commission was awarded a three year grant to construct the program through the California Bay-Delta Program in 2005. Program partners included Hart Restoration (Hart) and Ducks Unlimited (DU). Hart established vegetative buffers along irrigation ditch banks and hedgerow grass plantings. These plantings were designed to provide habitat for wildlife, improve water quality by reducing runoff of pesticides and sediment, enhance levee stability, and retard levee erosion. DU coordinated restoration enhancement projects which included creating seasonal and permanent wetlands on marginal farmlands. These projects provide waterfowl brooding habitat, a food source, and additional habitat sites which promote healthier waterfowl flocks. To date, these projects total 312 acres of seasonal and permanent wetlands and 6.5 miles of enhanced levees and waterways. Many of the revegetated areas are thriving with native plant life, have been repopulated by wildlife, and filter agricultural drainage which improves water quality and enhances levee stability. Multiple species of waterfowl are using the restoration habitats for brooding and feeding as well as staying later into the season.